One of the most useful accessories that technology has been able to produce for outdoor enthusiasts is the game camera. In this article we have listed the best trail camera reviews that will be very helpful as you decide what trail camera to purchase, which is another name for it, lets you position it in any area and leave it unmanned and take pictures or videos of that area. This is an excellent tool for hunters, wildlife photographers or even those who want to watch over their plot of land. They can stay hidden and capture in film what’s happening while in stealth mode. Be rest assured that the Best Trail Camera Reviews on our site will be very useful in your choice of the best trail camera picking. The most common use for these devices is for scouting purposes. Hunters like to find spots where they can scout during the off season. Their motion sensors activate them when anything comes around. This lets the hunter understand what’s happening in the environment and acts as a deer or hunting camera which lets you estimate the animal traffic in a particular spot. Another useful function is for security and surveillance. This lets you know if there are trespassers or intruders in your property. Since they’re weatherproof and they can be left there for long periods to time. Many of these remote cameras also come with night vision ability and infrared capability allowing them to capture subjects during times when light is low. The trail cam also works well as a spy or stealth camera. Set up covertly you can monitor, observe and see what others are doing by recording pictures or video in that spot. The Moultrie P-150 Panoramic comes with a plethora of features and uniqueness for the price. The motion detection can pick up heat signals within 45 feet. This is not very strong, but does the job well in forests and river areas which has wide empty spaces with heat inconsistencies. The panoramic vision is 150 degrees. The quality of the captured images is good, and doesn’t drain the battery. It has a great night vision sensor and illumination. The picture and video recording is clear and without blurring or noise. Max photo resolution is 8MP and video quality is 720p. Besides the array of features, it comes with a camo finish, and a mounting strap. Though it is not a top end camera, this is the best trail camera in the market for the price range, and for wildlife enthusiasts and stealth video capture for security. Hard to use with all the features. Next on our trail camera reviews is the the Bushnell 8MP Trophy Cam HD. This unit is an amazing entry level game cam with 720p recording. The plus point is that it sequentially records all the images, so that you can easily sort it in a PC. The picture clarity is great at night and day, with a reliable night vision illumination. The heat sensor is said to have 60 feet detection, but we found it to start faltering after 40 feet. Only large animals will have detection beyond that distance, while smaller animals like rabbits or hyenas will need to be as close as 25 feet to be detected. This is something worth considering if you want to take longer range images. The battery life is okay, and you would need to change it once a year if you are regularly using it. You can add the longitude and latitude position of the camera into the feed if you wish, which makes it easy to locate in dense forests and to arrange images from many cameras. Buy it if you are interested in wildlife photography, and need something cheap to monitor the jungle wilderness. Bad detection beyond 25 ft. to 35 ft. Intro, the Primos Truth Cam 35 is a budget cam in entry-level trail camera arena. The image clarity is a basic level 3MP and you get 640 x 480 video recording capability. Though it is low, it is easy on the memory as well as on the pocket. The Truth Cam 35 comes with a 3MP camera and 35 LED’s and a great LCD display with quality viewing. It comes with audio and video recording facilities. Uses 4D batteries and supports up to 8GB SD card. It has a one year warranty and has been tested to capture more than 80,000 photos. The 3MP camera captures clear color photos in daylight within 40 feet range, during night light it captures monochrome images in 1.3 Mega Pixels. Primos advertised this trail camera as “easy to use”, and it most certainly lives up to the expectations. Just insert batteries and SD card, set it up on desired location and you are ready to go. This game camera has out of the box pre-configured default settings. There is a security cable hole, which is molded through the case for prevention of theft. The camera also has password protection which provides additional security to the camera. This game camera captures good quality pictures in day time using the 3Mega Pixels resolution camera with no shutter sound. It is an Infra Red digital camera with good night light capture as well. The LED helps in night photographs, flash option is also there. It detects motion and heat. It is easy to use as the toggle switches make it easy to set to your desired configuration.To prevent any theft, security cable is molded within the case and moreover the camera can be protected with password. A strong hook scrap is also included with the set. However, you have to manually go and get the photographs out of the memory card, as no wireless option is there. This can be a problem if the terrain is not easily accessible. There are video or still image capture options. In this camera, an option of 10, 30 or 60 seconds video recording selection is available. It provides a live on screen view which can be helpful while setting up the camera. The LCD has easy to use menu and display options.It has a delay switch with 10 seconds, 1 minute and 30 minute settings. The sensitivity settings to detect movement can be set to high, moderate or low; it is capable to detect temperature as well. It has a 1.5 second trigger time when in sleep mode and 0.3 seconds in active state; capable to achieve 1, 3, 5, 7 or 9 images per trigger in burst mode. But, this game camera has been recorded to provide even better trigger time. For capturing images at night LED’s are helpful, but not to the expected range. A 40 feet range is advertised for day/ night images. This trail camera provides an option to select the number of active light emitting diodes, which can be very effective to enhance battery life. Set up is easy even on tree trunks, it is advisable to avoid extra canopy as it may give some white out shots. It can take pictures on its own when triggered by any noticeable change in temperature or scenery. All settings are easy to adjust and understand; an instruction manual is available on the camera door. This trail camera has a fast trigger speed, which is almost 1.5 seconds. The burst mode works really well when required. This camera uses a set of 4 D cell batteries. The battery life is long and durable. The only power source for this camera is the 4 d cell batteries. It does not support any external power source. Easy to use and install, easy to program. Cheapest trail camera in the market. Date, time, temperature and moon phase on each photo. Good quality clear and bright daylight pictures. Quick reference manual on camera door. Very bad beyond 15ft at night. Blurry and low quality night light photos. Probably the most easily available and easy to use trail cameras in this price range. It is very effective in open fields, captures even slight movement within a fairly good response time. The trigger time is to the point and sometimes even faster.It is specified to have 8GB SD card slot, reportedly it supports up to 16 GB, but no internal memory is available. This camera provides high quality video capture and stores it directly to the memory card, but the video can eat up lots of SD card memory. So, there is another option to save space, use the 5 shot photo feature, which captures images with a delay of 1 second each. The night capture has a range of hardly 10 to 15 feet, not 40 as advertised. However, daylight pictures are crisp and clear even beyond the coverage area of 40 feet. Overall the Primos Truth Cam 35 is a very good choice if you are on a budget. The price is under $75, so you can buy a flood of these picture snappers for intense research in thickly populated areas. On top of this, it boasts a 40 foot night vision ability with detection. Our cameras are over a year old and still gives the best performance on every recharge. Besides these little things, you can find Primos Truth Cam 35 useful if you need a lot of cameras to cover an area, or want something low on the budget. With 8GB, it can last for weeks before filling up. The Moultrie M-990i No Glow Game Camera comes with a 10MP camera and 70 foot motion detection system. The best feature in the Moultrie M-990i is its motion freeze, which stabilizes every shot to reduce blurring. The videos record at 720p. Both the images and videos have phenomenal quality in daytime and night. The night vision is really strong, and it can capture still images even at 45 feet away. At 10MP, the SD card would get full pretty fast, but you can adjust to lower settings if needed. This is good for saving battery and memory for long research projects or scouting sorties. Overall, a great game camera with all the best features a trail camera would have, but it misses out on panoramic movement for the price. 10MP image quality, 720p video capability. The paint finish is weak. The Plotwatcher Pro HD is an advanced trail camera. It comes with a 2.5 inch LCD display that can be used for immediate viewing of videos and setting the device on a location. The feed system records the temperature and moon phase on every image. You can also add third party lenses on the camera to enhance its quality. This is a great camera for long time use and for time lapse study. The clarity of the videos is amazing, and the LCD screen is really handy for quick selection and deletion of the videos. Can add zoom and wide-angle lenses. Bushnell X-8 6MP trail camera with Night Vision and Field Scan has got one of the best reviews. Bushnell Company is famous for its quality products, most of them with positive feedback. This camera is worthy because of its 4 or 6 MP high resolution photos. The video capture is for 15 seconds which is also high quality. It works on a set of 8 AA lithium batteries which can work up to 9 months easily but you can also use an external DC power source if required. It has an auto day or night sensor, which makes it capable to click photos according to the natural light available. There is a 36 LED night vision flash, the range of this flash is 46 feet as advertised for day/night vision. It has a “field scan” mode which is perfectly suitable for watching fields or plots. It also takes high definition night images along with high quality video recording at night. This trail camera accepts up to 32 GB SD cards. It can work easily in a wide temperature ranging from -5° F to 140° F. It can be used with a cable lock. The package includes a strap with plastic quick release buckle, adjustable wet belt, camera, USB cord, ¼-20 socket, stereo cord (for TV) and user manual. The user manual is actually very easy to understand, comes with helpful and informative instructions. This trail camera comes with a selection from 2, 4 or 6 MP resolution images and 640X480 pixel high definition video captures (from 5 to 15 seconds, programmable). The PIR (Passive Infrared) can be adjusted to high/medium/low setting, when set to low it allows you to take closer pictures. This motion sensor can be set off to 45 feet maximum. The trigger is an impeccable 1 second which captures photos in a blink. The IR and motion sensor range is up to 55 feet. The multi-image mode can be set to 1 or 3 images per trigger. The available trigger interval is from 1 second to 10 minutes. There is a default “field scan” mode which is meant for covering large open spaces like fields and plots. Images can be taken in this mode at pre-set time intervals; the time-lapse mode has 1 to 60 minutes of selection options. The sensor mode when set to ‘high’ has extremely good sensitivity to motion and therefore captures many images. Even a slight movement of a tree branch triggers it which causes many image captures, leading to wastage of memory space. But, it is advisable to set the sensor to ‘high’ in hot temperatures, as otherwise it becomes difficult for the camera to differentiate between heat from animal bodies and the surrounding atmosphere. Meanwhile, it is good to set it to ‘low’ in cold temperatures. The LED flash distance is claimed to be 60 feet by the company, but is actually 45 feet. The motion sensor triggers and captures images even in between set times when something comes within range of the sensor field on field watch mode. The night light images are also very good and clear, but not as far as the range specified in the manual (which is 45 feet). It gives clear and blur-free images till 15-20 feet but above that images start to get a little hazy. But this is acceptable as the image quality is not much compromised. There is video recording option even at night which turns out to be good in quality, which is a bonus. The overall camera performance is good with a positive feedback. However, the number of false triggers increases to a great number when the sensitivity level is set to ‘high’. The flash range is actually very less, it is about 20 feet and not 45 feet, as claimed. The sensitivity settings should be changed according to the climate in order to reduce the false triggers. It is advised to do so as it reduces the number of false positives, which in turn saves lots of memory space and hence improves the performance. It uses 8 lithium battery set, which can easily work up to 9 months. It is a good battery life span considering the image and video resolution. Additionally, this camera can use an external DC power source as well. The option of an external power source can be of great advantage to anyone who indulges in full utilization of all trail camera features. Auto sensor for day/night light. Lots of false triggers due to high sensitivity. Menu navigation can take some getting used to. The case is a camouflage green colour which can be easily hidden. It contains 20 white light emitters which are amplified. Just below the lights there is main lens and Passive Infrared light. When you open the back door the inside is same as other trail cameras, there is an LCD, control buttons and an 8 AA battery holder. Sensitivity levels of picture triggering mechanism are adjustable. The day time pictures on a good clear sunny day have amazingly sharp colour and quality. Another advantage is the white LED flash. The incandescent flashes have a snapping sound when pictures are clicked at night but there is no such sound in a white LED flash. There is not much security on this camera case, just one lock loop on the door. There is no built in Python cable insert either which is another minus for security. Quality day and night photos are the best part of this game camera. The operating temperature of the camera is -20 to 60 degree Celsius and the storage temperature is somewhere between -30 to 70 degrees. Delay in pictures can be programmed to 0 seconds, but even with 0 setting the camera takes its own time to come to life and click photos which is a major drawback. Time lapse can be adjusted between 10 seconds and 8 hours. This time lapse function runs 24 hours at one time when selected because it has no adjustable operating window. The camera flash is not up to the mark and is weak. The camera survives really well against weather changes. This camera might surprise you with its good working; the sensing was 70 feet at 73 degrees of horizontal viewing. The pictures clicked on a bright sunny day time are also exceptionally good and the resolution is much better than stated and better than any other camera of same resolution. The degree of haziness in day time images (if there is any in some of them) was not as apparent. The camera has a good detection range of up to 90 feet. The detection range actually works pretty well. The night flash functions good enough for about 50 feet. It works as good as any other strobe white flash camera of its range. The camera shows a red flashing LED light when it works. However, when tested in field it does not scare off bucks or any other animals. It uses a set of 8 AA lithium batteries, which are said to work for 500 ten second video clips with LED lights. According to recorded field test the batteries lasted for almost 4 to 5 months and took a total of 4000 photos and 450 video clips. This camera shows the low battery indication with an LED alert. Lithium batteries are used in this game camera which have a longer life expectancy and produce brighter night photos than alkaline batteries. The battery life is amazingly long and durable. The Scoutsguard SG560C is a commendable work of technology, especially when it comes to night time photography and video. With its great detection range and fairly good battery life it can be one of your top most choices. Below 250 dollars, this camera is a good selection. The blur in night time pictures is observed only beyond 50 feet, which is acceptable. The wide detection range also sort of makes up for the slow triggering speed. The security aspect is a little low as there is only one loop lock to secure the camera. But this trail camera is tough and sturdy, so it is fairly weather proof. The Moultrie A5 Glow game camera can be used for scouting potential game areas. It can also be used for home surveillance. Most attractive feature is the price which is under 60 dollars. Because of the low price of this camera, it is suitable for large properties as multiple cameras can be employed for easy surveillance. It covers about 50 feet area. It comprises of a 5MP camera with night and day video recording. It provides 10 second video recording. This camera is capable of providing clear crisp shots in many different lighting conditions. It requires 4 C cell batteries which can work up to 8,000 images. The storage capacity is 32 GB on memory card. Each image or video captured by the camera is marked with date, time, moon phase and camera ID. Mounting and set up is easy, the camera comes with integrated mounting brackets which ascertain security and stability while mounting the camera. The package includes an integrated strap loop with Python cable compatibility, but sadly it does not include the cable. It uses Infrared light so it is good to be used in low light and low temperature areas. This trail camera has a 5 Mega Pixel resolution with a picture delay selection of 1, 5, 10 and 30 minutes. The motion sensor of the camera is extremely good and one of the best suited for game scouting. It is advisable to trim the tree branches and clear-off any other interference in near proximity to avoid false alarms. It is also equipped with powerful night vision which allows clicking monochrome images up to a wide area, which it claims to be 50 feet. The day light images and video capture is satisfying. One major drawback to this camera is that the shortest delay available is 1 minute, so no matter what it does not capture images with interval less than 1 minute. This 1 minute can be crucial at times, a lot can happen in one minute you realize this when you compare two back to back shots. Another drawback is that it takes a long time to wake up when triggered. Sometimes an important initial shot is missed as it takes time to wake up from sleep and capture the first shot. False triggers can be irritating as there are so many with this trail camera. Even a slight breeze or change in wind direction can trigger the camera. Such false triggers do not capture any real action and end up eating memory space. Rain and other small variations in climate do not affect the camera in any way, which is a pro. There are no issues with the image quality, a sample shot is included below. As you can see in the image below that the day time images are bright and clear. A red light glows in the Moultrie A5 trail camera while it clicks a picture or makes a video. The manufacturers claim that the flash range is 50 feet at night, but actually when tested it is not up to the mark. The night flash does not capture images beyond 20 feet. Out of the captured photos the images beyond 10 to 15 feet are a little hazy sometimes. Since it uses infrared, there is no flash to spook away the animals it is capturing. However, the dim red light even while it was blinking did not have any effect on the animals even after they saw it. So it is not much of an issue as it does not change their behaviour. But if you are using the camera for home surveillance, the blinking red light might be problem. Any thief or trespasser can become aware that he is under surveillance, this might alert him. One solution is to mount it on a tree or some high inaccessible place, so it becomes difficult for any trespasser to notice or reach. The Moultrie Game Camera with A-5 Low Glow offers a reliable, convenient and durable method for capturing any potential game in many different locations. The overall working is appreciable as the results are crisp and clear photographs, the late response or trigger time can sometimes be an issue. But the late triggering time should not be much of a problem when you have multiple cameras employed on a single property. Due to its low price, you can use multiple cameras for a large field or for your entire property to cover more area. So it is recommended to buy this if you want 3 or 4 cameras for your property. As we continue to provide comprehensive trail camera reviews, this post will review the Browning Recon Force trail camera. 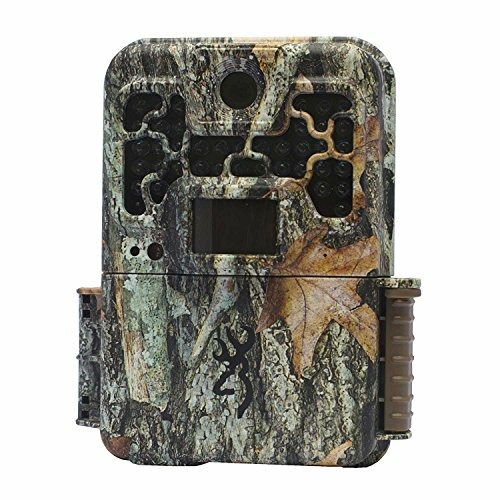 This Browning trail camera features a camouflage outer casing that resembles tree bark allowing it to blend in well when attached to a tree. It also provides eight interpolated Mpxl, 1/20 second shutter speed at night, six rapid fire shots in two seconds and a flash range of 60 to 70 feet. The camouflage outer covering of the Recon Force is of excellent quality and sets the camera apart from other examples in the same class. Once the camera is attached to a tree, it is difficult to detect. A camouflaged camera is good camera to use in high traffic areas and in areas where you may be worried about the camera being stolen. The camera is responds quickly, performs reliably and snaps gorgeous pictures in all types of trail conditions. It is a mid-grade camera model that uses infrared red glow technology. Even though this camera can be considered a mid-grade that can support most budgets, it captures images that are very clear. The Recon Force Trail is a trail camera which has impressive specifications such as an especially fast trigger speed of 0.69 seconds, a quick recovery time of 2.3 seconds, a solid detection range of 50 feet, and a flash range of 60 to 70 feet. Daytime pictures that are taken with this camera are bright and clear with good color. At times, the clarity has been found to be a little off. The Recon Force trail camera provides better images than most cameras in the same class, especially when capturing subjects in motion. Nighttime images are of less quality than those produced in daylight. The infrared flash allows for good contrast and clarity with minimal blurring. If the camera is approached in a five to eight foot range of the camera, the image will appear white due to the flash range provided with the model. Based in the United States, Cuddeback endeavors to design affordable and effective digital game cameras to help hunters improve their outcomes. Each camera is intended to work well but not cost much, and Cuddeback designs each model in the United States. The Attack IR five-megapixel game camera is an example of the durable and effective digital cameras Cuddeback offers hunters at prices that won’t impact their bank accounts. The camera is a highly effective scout camera that blends in with the natural cover and won’t look out of place when mounted to a tree trunk. It also is available at a very affordable price point that allows hunters to buy more than one camera and set them up in different areas to get a better assessment of potential game in their intended hunting areas. Its versatility and ruggedness earn the Cuddeback Attack IR game camera generally positive game camera reviews . Cuddeback’s five megapixel infrared digital camera works very well during moonless nights as well as during the day and can help to locate and take photos of game from up to 60 feet away. It has a powerful flash using 36 LED lights that can light up the night and illuminate any moving game. Getting a clear picture is done with a quarter-second trigger that helps the camera to capture even fast-moving game. This game camera also has a video mode that shoots 30 seconds of video footage at 24 frames per second. Hunters can make still photos from the videos and better analyze any potential prey that might be captured by the camera. A 60 megabyte internal memory stores hundreds of photos, and a removable SD card provides more options for storing images and videos, making the Cuddeback Attack IR possible the best game camera in its price range of less than $200. Many trail cam reviews emphasize the need for a good game camera to actually get pictures of game instead of photo after photo of nothing but woods with no animals in it. The Cuddeback Attack IR digital camera has a particular feature that hunters will find especially useful is the game camera’s “centered-subject technology” that makes it possible to see more than just a head or the hind end of a game animal as it moves past the camera. With the centered-subject technology, the camera automatically adjusts the angle to center the subject and take high-quality photos. For hunters concerned about not getting a good look at game in their trail cameras, the centered-subject technology and lightning-fast camera trigger help to ensure success. If game is in the area, whether it be deer, elk or any other popular hunting prey, the Attack IR digital camera likely will get it if it comes within 60 feet of its infrared sensor at any time of day or night. With a retail price of about $175, the Cuddeback Attack IR game camera works very well for hunters who need to scout hunting grounds but don’t have a lot of time to do it. Ranked as a best trail camera in its price range, it does have some minor flaws. With only a 60 megabyte internal storage, SD cards will be needed to ensure the camera will work properly and not run out of storage space between visits. Using four D-cell batteries, the camera can run them down pretty fast if the weather is very cold or hot. Despite minor setbacks, the Attack IR game camera is an unmitigated winner available for a relatively affordable price. When it comes to hunting your favorite game, it is vital that you get good images that help you stay on their trail. The Cuddeback E3 camera is an all-around impressive trail cam that should be an excellent option for hunters. This camera comes with a 20MP resolution that offers a 1-5 image burst mode. This means that you can get a variety of different views. It also offers multiple motion sensors selections, including during the day only, at night only or both. As for the type of pictures that you get with the motion sensor, you can choose between getting photos or video playback, as well as the option to add sound to both of these returns. With this footage, you can select a variety of different time lapse options, ranging from 10 seconds to 48 hours. Another major benefit of the Cuddeback E3 Trail Cam is that it will display the moon phase directly on your photo or video. This makes it much easier to track game based off their behavioral patterns. And you won’t have to worry about readjusting the settings or the time for daylight savings time, as this is done automatically with the camera. A very large camera that offers a wide angle for you to see more action. The battery life is extra long, so you won’t have to readjust or change them to get more power. The ability to record and recognize moon phases and time adjustments is a helpful addition that you may not appreciate, until you have it included on a camera. Attaching this camera to a tree or a post can be difficult at times. But onnce it’s attached, then you should be fine in a variety of different weather conditions. However, getting it in that position could be a bit easier. The Cuddeback E3 Camera is a compact AA powered no glow IR camera takes color images day and black/white IR images at night. Great camera for all around use. Whether you are heading out for your next hunt, or if you are simply wanting to set up a camera on your property to keep an eye on things, the Cuddeback Black Flash Model E3 is a great option. It offers plenty of benefits that are comparable to other units on the market, at a price range that makes it a true value. Despite the few weird photos, there are plenty more reasons to buy this unit than to skip out on it. If you are in the market to buy the best trail cam for the money, then what kind of camera would you want to purchase? Because there are so many brands of trail cams to choose from you could actually get frustrated quickly just trying to pick the camera that is right for you. Before you go out and start browsing the store shelves, let us help you become an informed consumer. We will walk you through the capabilities and features of the highest rated game cameras through our ultimate camera comparison guide. Since you are reading this article, you are someone that does the research needed to decide exactly which trail cam you need for your use. You don’t want to buy just any remote camera, you want a reliable camera that is durable, will meet your needs and the best trail cam for the money. This interactive chart provides game camera reviews that will help you decide which is the best camera for you. Browning is a leading manufacturer of firearms and other sporting goods for hunters and outdoor enthusiasts. The company is best known for their fine assortment of hunting firearms. They also sell a variety of hunting gear from boots to camouflage clothing. Other outdoor gear the company feature includes hunting knives, gun safes, compound bows, fishing rods, reels, ammunition and game cameras. Located in the great state of Utah, the company was founded in 1927. Browning has an assortment of trail cameras used by hunters who like to have an idea of what kind of game might be available on their property. The Strike Force is one of the top trail cameras in use today. It is the top favorite of the Browning line of cameras. With its incredible small size and image quality, the camera makes an ideal addiction to any hunter’s inventory of equipment. The price varies on this camera. It depends entirely on where the purchase is made. Rapid-fire mode strikes out most to those looking for a high quality game camera that can deliver up to 6 images at .03 seconds apart in a burst pattern. Each time the camera gets triggered by movement, it will take another set of images. More information about wildlife that inhabits the property can be seen in those images taken by the camera. The audio feature is extremely useful to the owner because it gives them the opportunity to listen to what is happening in real time during the video. An animal could be in view of the camera but by listening, the chance of hearing more animals in the area could be heard from them walking around in the dry leaves or brush. This trail camera makes great images without any visible blur in the photographs. Images taken during the night hours do show a lot of white in the background but that might be due to flash or low battery power. It might also be linked to the animal being very close to the camera once the image is taken. All day images show in color while night images are in black and white. Dimensions at 4.75 x 4.0 x 3.0, this camera easily fits into a large pocket. Camouflaged design makes the camera unnoticeable. Long-life lithium batteries will extend the cameras operating hours significantly. One of the fastest trigger speeds around 0.70. Photo information is included in the shots. Detection range may vary from 50 – 70 feet. Supports up to 32 gig memory cards. Recovery time of 2.3 seconds. Compact size could make the camera easy to lose. Video shuts down quickly during night use. Hunters can’t go wrong on the purchase of Browning trail camerasTrail Cam Review. Based on our extensive list of trail cam reviews, we consider the Browning Strike Force a best trail camera for the money that you will be satisfied with. The affordability of owning one or several of these best trail cameras make buying these models a good decision for all of those outdoor needs. The Leupold RCX-1 game camera is the next camera that we will provide a detailed review in our game camera reviews. The RCX-1 is a very unique trail camera that can be used in a variety of applications. With this trail camera, you will get a camer with exceptional picture quality to go with a quick detection circuit. It is also very simple to program with its easy-to-use remote control. The Leupold RCX-1 is a game camera that is definitely a good choice for use by game hunters and as well general wildlife monitors. The RCX-1 comes with an 8.0 megapixel camera that takes image with both good color and clarity. This camera also comes with 36 infrared LEDS which enable sensing of motion as far as 36 feet away. Its digital shutter is silent with a speed of the blink of an eye. This most innovative feature of its system is the RCX controller, also called a viewer, which is portable and can plug into the USB jack of any camera to enable a complete control of the system. It facilitates real-time alignment of the camera’s viewing angle and instant access to all the program settings and pictures captured. This controller is necessary for step-by-step programming and customization of your camera settings which include picture quality, time-lapse, operation hours, file size and type, as well as separate day and night settings. It also enables you to download high resolution photos and videos right in the field without having to make trips to and from home to check SD cards. Using the remote to program this camera provides you all the options of this Leupold trail camera. Programming the camera for the basic settings is very easy and intuitive. However, because there are so many different settings and options, programming this camera could get overwhelming. If you are comfortable working with technology then you will not have any problem customizing this camera to its fullest capabilities. This camera does not have a on and off light and therefore it is not easy to tell whether it is on or off. The straps with a plastic connector on the camera are also not the best when fastening the camera to maybe a tree, hook receptacles would work better. In order to make the most apt choice, you need to consider your priorities, like budget, quality and features. If you want it just for the sake of fun and adventure then you can go for the cheap ones or the ones with a comparatively lesser cost, but if you are a professional or looking for a high end features, you need to empty your pockets a bit. There is a large range in which trail cameras are available. Some may be simple while some may be so complex that it will nearly take a lifetime learning their features. The coming paragraphs will guide you to look up for the right features while purchasing one. The best trail cameras are the ones with high resolution potential. The higher the megapixel, the clearer would be the picture. But higher megapixels also need more storage space for the image and high resolution cameras have a higher cost too. So depending on your priority, you may chose. Paying for a quality battery, having a long back up will be helpful for you in the long run. However, rechargeable batteries will be a better option if money is more important over time. Lithium batteries are the most expensive ones, but have the longest life. The choice of an incandescent or infrared flash trail camera in one of the difficult ones. If battery life or power is the priority, infrared camera would be the best choice as charging before each flash is not required. Other features which makes it a better option over the incandescent flash camera is the comparatively lesser chance of spooking the animal. Incandescent cameras on the other hand have a better resolution as well as quality. There are a host of other factors that can be considered while buying a game camera. The detection range, recovery time (the speed at which pictures can be taken one by one), flash range, TV and USB connection compatibility are some of the main features to be paid noted to while buying a new trail camera. Hope you liked our Best Trail Camera Reviews article, there are so many trail cameras on the market, so its vital you take your time choosing the Best Trail Camera.